Elastic cartilage. Atlas of Plant and Animal Histology. The image is from the outer ear of a mouse. Organ: outer ear, elastic cartilage. 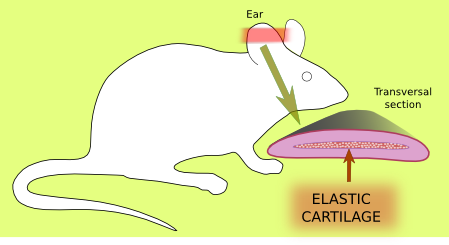 Elastic cartilage is located in the outer ear, the ear canal, Eustachian tube, epiglottis and larynx. It has little extracellular matrix, which is mainly composed of highly branched elastic fibers. Elastic fibers contribute to the mechanical properties of this tissue. Elastic cartilage is not formed from from mesenchymal tissue, but not from chondrogenic centers. 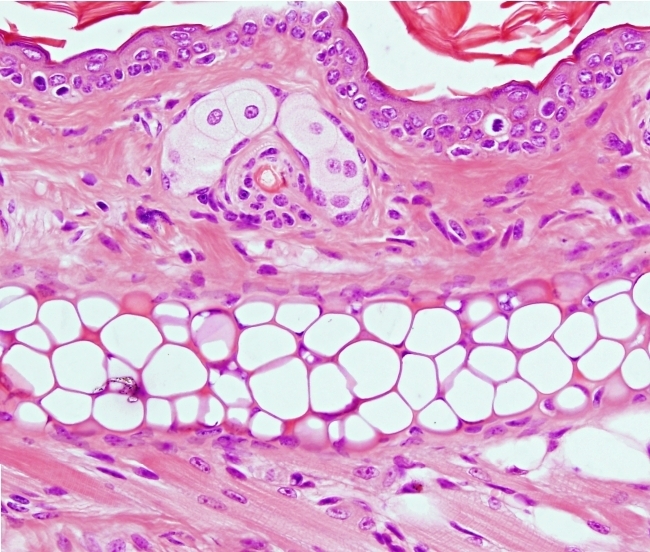 Perichondrium, a thin layer of highly condensed connective tissue, covers the surface of the elastic cartilage. The isogenic groups, groups of 2 to 4 chondrocytes, are not easily observed. Elastic cartilage does not ossificate nor it is capable of self-repairing.